Shakespeare in a frat house? The USD theater department has their opening show of the year, and it mixes classical Shakespeare and modern American culture. Tim Pyles, assistant professor said he chose the show Love’s Labor’s Lost because it connects with the college crowd and he feels it’s important for his students to learn. 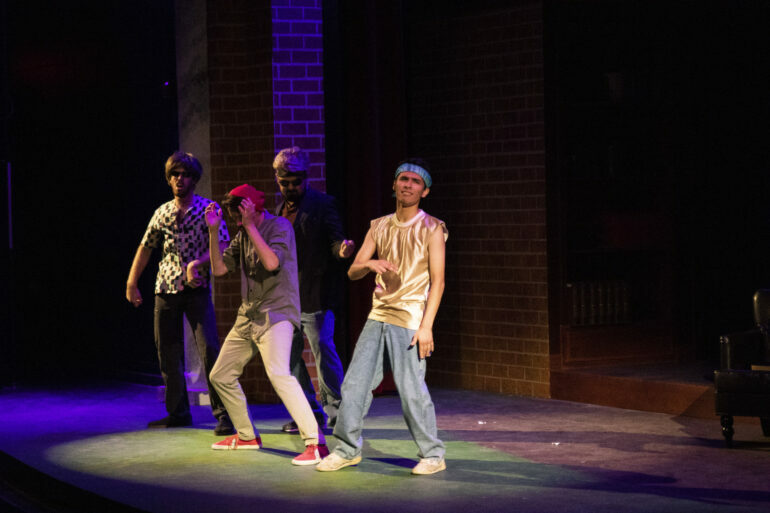 The production is modernized with pop music and is also set in a contemporary fraternity house. Pyles said that the main male characters reflect the stereotypical frat guy and that was part of the influence in having the set as a frat house. “They don’t totally get what women actually think, what women actually are looking for, what women actually care about…they think it’s all about being cool,” Pyles said. The male characters in the show plan to throw themselves into studies and block all distractions, including women, but their plans fail. Jackson Whitaker, junior theater major and actor, said he enjoys seeing the men actually try to solely focus on their studies. “I think that it’s fun to see people of our age to go against the cultural norm and to see that live out on stage will be interesting,” Whitaker said. Whitaker plays Don Adriano de Armado in the play, and his sidekick, Moth, is played by Tess Jones, a senior acting major. Jones said she draws from her childhood to play Moth. Pyles hopes people still come to the show, even if it may be a little more difficult to understand because of it’s language. “What I want is for people who are a little bit skeptical about Shakespeare or a little bit even afraid of Shakespeare or turned off of Shakespeare, I hope that they would give it a chance.” Pyles said. The show will be performed again on Sep. 26-30 and ticket information can be found on the theater departments ticket information page. Video by Ali Boysen courtesy of Coyote News.